Tupapa Maraerenga Football Club has claimed the Van’s Premier Men’s Round Cup 2017 championship title and has earned a spot at the OFC Champions League Preliminary in American Samoa next year. It has been one of the best seasons for the Tupapa Maraerenga premier men’s side, who maintained an unbeaten run in their division, and although it was snapped by Puaikura today, they have done more than enough to stay ahead of the competition this year. The side has invested a lot of hard-work into their season and it has all paid off with the team now preparing for American Samoa in January. In a thrilling match between last year’s champions and this year’s champion. The two giants met in a mouth-watering encounter on Saturday at Victoria Park. Misunderstanding from the goal keeper allowed Puaikura to score four goals within thirty minutes. Tupapa Maraerenga lost their first match of the season after leading 4-1 at the break. Puaikura won the big game of the day 5-4. The first and only goal in the first half for Puaikura came three minutes into the game. Pekay Edwards was on target for the visitors and slotted in an easy goal benefitting from a mistake from the Tupapa Maraerenga goalkeeper. Lee Harmon’s free kick got Tupapa Maraerenga back on level terms. He sends a shot soaring right over the keeper and into the net. Minutes later Mii Josephs free kick rebounded off a Puaikura defender in the box and Geoffrey Strickland followed it up, and wacked the ball into the net. Puaikura had the opportunity to put another score on the board when Dwayne Tiputoa stole the ball from Lee Harmon in their half and sends a powerful shot that was deflected by the Tupapa Maraerenga goalkeeper. Great passing pattern saw Geoffery Strickland connect with Cambell best who came up with a superb finisher, powering a shot into the bottom right corner of the post. In the 37th minute Luke serves the ball in front and Geoffery Strickland leaped and headed it into the net. Puaikura were seemingly heading for defeat when they trailed 4-1 at the break. In the first ten minutes of the second half, Puaikura exceeded its first half goal production in a dizzying display of ball movement and finishing. What Puaikura did in the second half was absolutely astonishing. Pekay Edwards flicks a ball that eluded the Tupapa Maraerenga defenders and Anthony Samuela races in from the midfield and smashes the ball into the net. Kimiora Samuela dribbles the ball and sends a lob pass to an attacking Pekay Edwards who makes no mistake in putting away another goal. They were scoring in quick succession and after taking the lead with seventeen minutes on the clock. Anthony Samuela’s side produced an incredible fightback to win 5-4. In the other premier men’s match ups, Takuvaine overcame Avatiui 3-0 in their final game for the round cup competition and Nikao Sokattak thrashed Titikaveka 7-0 at home. It’s a close battle for second place on the points table and Nikao Sokattak will have to win their last game to better their chances of a podium finish. 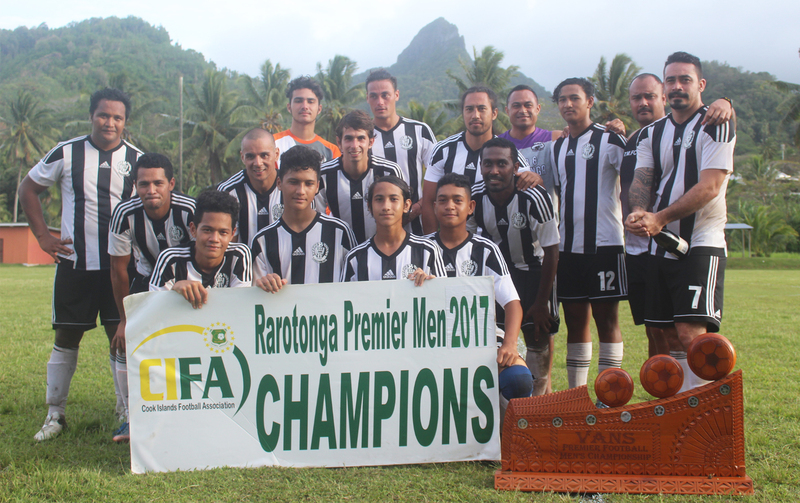 CIFA would like to congratulate the winners of the 2017 Van’s Premiership title and bid them a successful OCL Preliminary campaign in American Samoa.